Home / GST-Tally / How to Create a GST Taxable POS Invoice in Tally? 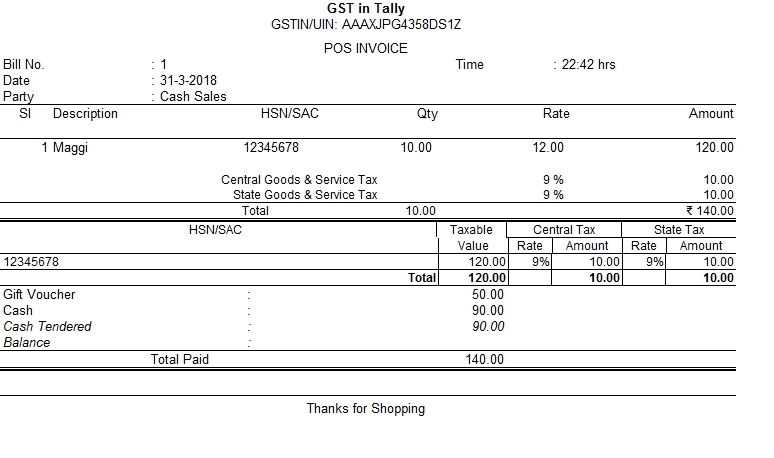 How to Create a GST Taxable POS Invoice in Tally? POS invoice contains multiple payment mode. I think everyone do shopping in Big Stores and malls, at the time of payment some time we pay half cash and half from credit card, debit card or any other source. So POS Invoice showing all these payment methods. In this post we know about how to create a pos invoice with GST (Goods & Service Tax) Tax. How to Create POS Invoice with GST Tax Effect. Do you know current tally release 6 have all the pre allocate features of POS Invoice like payment received from multiple options through credit card, cash, cheque, gift vouchers etc. You can see there is two type of payment option available in Sale voucher (Invoice). You can enter each item in all 4 payment options (Credit Card, Gift Voucher, Cheque Payment & Cash) in POS Invoice.